Just got access to a Ransom Rest and have been playing around with it. What are typical groups for a stock S&W revolver at 25 yards? An internet search has them all over the place and I would like a baseline to evaluate my pistols. Best 148 HBWC factory ammo K38 groups I ever got were 1.5-2" at 50yds. Never did 25. Best factory DR ammo was 2.5 at best. shoot308 wrote: Just got access to a Ransom Rest and have been playing around with it. What are typical groups for a stock S&W revolver at 25 yards? An internet search has them all over the place and I would like a baseline to evaluate my pistols. 25 yds won't tell you much. Much greater differences at 50 yds. 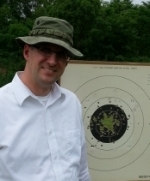 I have a really long thread on this forum about DR legal ammo--with pictures of the test results--My S&W revolver shoots great 50 yard groups, but only with FACTORY Remington UMC. The ammo that I would make at home shot very well at 25 yards but was so bad at 50 yards that some of the shots weren't scoring. You would have to have an extremely bad gun/ammo combination to have a gun that wont shoot 100s at the 25 yard line. Like Dave KP said, do the testing at 50--that's where you are going to learn what ammo your gun likes. My model 14 likes all 148gr HBWCs, but only Factory Remington UMC 158gr LRN. Buy some known high accuracy factory ammunition and test that in your gun. Most quality factory ammo shoots pretty well in most good guns. Testing 2-3 different factory loads should give you a base line to work from. What calibers are you working with? Shooting 38s. Only have 25yds to work with until it warms up. Have my S&W 14 down to 1 1/4 10 shot groups with home made button nosed wad cutters and 1 9/16 with hard cast 158 SWC. S&W 21 yds 2.5" for short barrels in 38 cal. shoot308 wrote: Shooting 38s. Only have 25yds to work with until it warms up. Have my S&W 14 down to 1 1/4 10 shot groups with home made button nosed wad cutters and 1 9/16 with hard cast 158 SWC. If the 1 9/16 158gr. load holds up at 50 you're in pretty good shape. At that point I'd start trimming cases to identical lengths, inspecting/weighing bullets, trying minor variations in powder charge and different primers. This can get exhausting. I got 2- 3/16" at 50 yds with Federal American Eagle 158gr. The best I could get with 158gr Remington bullet handloads was 4 1/2".